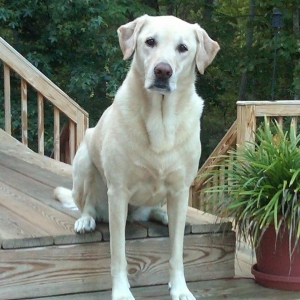 Our 7-year old yellow lab, Charlotte, was diagnosed with Cushing’s disease this past spring. If you’re on this website, you are like me…..our pets are not LIKE family….they ARE family. In hindsight, Charlotte starting showing symptoms around late summer 2010. Her personality was just not as ‘bubbly’. She seemed depressed and lethargic. Around October we noticed that she just could not get enough to drink. Then she started urinating in the house regularly – which was just not like her. Around Thanksgiving 2010, we took Charlotte into her vet for testing. Her urine checked clean and blood work looked great. There were no medical reasons to proceed with further expensive testing at the time. Throughout the winter, Charlotte became extremely lethargic. All she did was lay around and sleep (except for meal time, of course….she never missed an opportunity for a meal). The excessive drinking and urinating worsened. Then in March 2011 we noticed that looked absolutely skinny. Her spine and all bones were protruding – even in her face and head. So we took her back to the vet in late March for more testing. This is when Dr. Loehr (Town & Country Veterinary Clinic) agreed that SOMETHING is wrong. Dr. Loehr found her blood work to be normal. She had a slightly low heart rate, but she showed high levels of protein in her urine at this time (which was NOT the case in November 2010). His initial concerns were with either diabetes insipitus (not a sugar diabetes) or Cushing’s disease. He leaned toward diabetes insipitus because she was not showing common symptoms of Cushing’s disease, such as pot belly and hair loss….weird. We started measuring Charlotte’s water intake. We found that she was drinking up to 6 quarts a day, which was 2-3 times the normal amount for a dog her size. She had also lost about 10 pounds of critical muscle mass – hence, the protein in her urine. She trialed an oral medication for diabetes insipidus. This actually curbed her water intake but had no effect on the levels of protein in her urine. By the end of April, Charlotte started showing neurological symptoms. She had been having random tremors (asleep or awake) for about 2 months. Then within about a 2-week span of time, she went paralyzed on the left side of her face, the tremors increased, she circled incessantly to the left, and started losing her balance when walking. By Easter, she looked like a walking zombie! Watching her degrade so dramatically and so quickly was heartbreaking and frustrating with no diagnosis. Many things had been narrowed out, but we still had no diagnosis….. Her vet admitted that he had done all he could do and referred us to Dr. Lori Rios with Veterinary Referral & Critical Care, a veterinary internal medicine specialist in Goochland, VA. Dr. Rios performed a thorough ultrasound of Charlotte’s abdomen and took lung x-rays. She wanted to look for any tumors on her adrenal glands (another form of Cushing’s disease) or any other abnormalities/tumors. The x-rays and ultrasound looked normal. But she was highly concerned with Charlotte’s neurological symptoms and suggested an MRI of her brain as soon as possible. So with Dr. Rios’s assistance, we got her into to see veterinary neurologists at NC State Vet School within 2 days. The NC State neurologist performed a physical and neurological exam. They really were amazing to watch! They definitely agreed that an MRI would be necessary, which was performed same-day. The neurologists did not even wait for the radiology report from the MRI…..they could easily see a large-sized tumor on her pituitary gland and immediately diagnosed her with pituitary Cushing’s disease. As heartbreaking as this was to hear, we were almost relieved to just have a diagnosis and were reassured when we found there was something we could do. Apparently pituitary tumors shrink well with radiation treatments. We were given the option to do a 3-day radiation course or a 16-day (recommended, more effective and longer-term). Obviously, we opted for the 16-day radiation treatment. Otherwise, she was probably 1-2 weeks away from death. So within 2 business days, we had Charlotte admitted into Oncology at NC State to start her radiation treatments. She received about 15 minutes of radiation for 16 business days, coming home for weekends. It was an exhausting and stressful time. We could not have been happier with the persistence and sense of resolve with all of her veterinarians – including Dr. Frederick Loehr, Dr. Lori Rios and Doctors Schwartz (NC State Veterinary Neurologist) and Pruitt (NC State Veterinary Oncologist). I am so pleased to say that 6 months after completing her radiation treatments, Charlotte has made a complete turnaround. Her facial paralysis and neurological symptoms have gone away. She is back to her normal weight. She drinks normal amounts of water and has stopped urinating in the house. But most importantly – she is back! Her personality, sense of humor and desire to play are back – stronger than ever. We know that the tumor has just shrunk, but will grow back. We were told that the average prognosis is 3.5 years. We do intend to have a follow-up CT scan performed of her brain to show an “after” shot of the tumor. This is not required, but we are curious and this is our fur child. I don’t know how much longer we will have Charlotte, but we hope she lives a full, happy life. I am mother of the year, I’m sure. We can sleep at night knowing we did any and everything we possibly could. Although this may sound cheesy, Charlotte truly is the sunshine of my life and deserves everything we have done for her to save her life. Charlotte attended her first FETCH event on 10/30 at the Mutt Strut. There, she met Mike, Tom, Joanne, and the other amazing people involved with FETCH a Cure. Charlotte could be a poster dog for FETCH and is a living example of how FETCH a Cure can impact the lives of pets and their families. We were fortunate enough to come up with about $10,000 of unbudgeted funds last-minute. But we were lucky; many people would not have that ability. So from Charlotte and me – we appreciate everything FETCH a Cure stands for and we look forward to our involvement with future FETCH events as long as Charlotte can participate!